It’s been a long while since I posted a full dinner recipe. And really it’s about time. No matter how much I cook, I’m always in need of dinner recipes. Somehow dinner cooking feels heavy, uninspiring, maybe draining in a way routine tasks can get. I get it. I go trough cycles between excited to make food to tending to the chore just to check it off the daily to do. But no matter which funk I’m in, I love making one-pot dishes. For their simplicity, for the sparse dishes to wash, for the quickness. All those things are the lens by which I work to put food on the table, happily. It makes nourishing my people pleasant and uncomplicated. Not that I don’t believe in recipes that call for countless steps and your arsenal of pots and pans. I love those too. They’re magical and important. Just not every day. 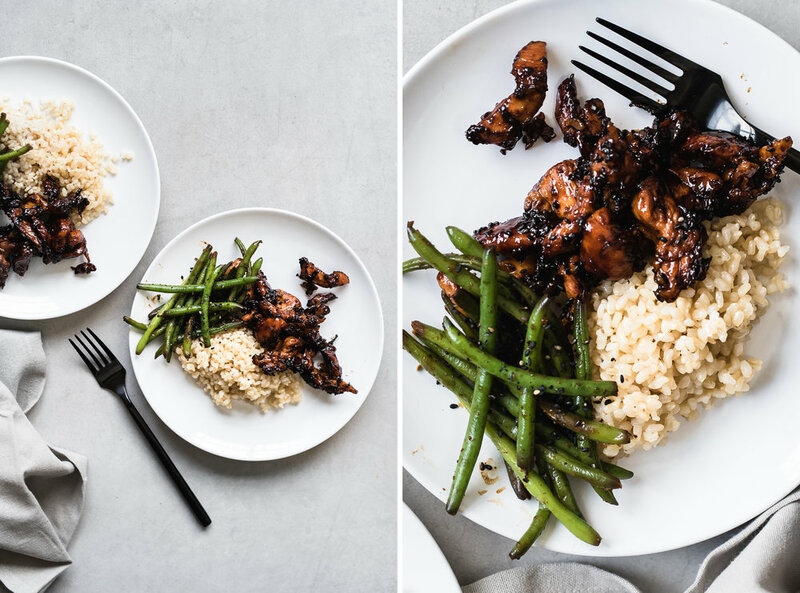 These Sticky Asian Chicken Strips with Green Beans are flavorful, made in one pan, a complete meal, and will make it into your dinner rotation weekly once you’ve had a taste. The rice might necessitate cooking in another pot, but hey, make a double batch snd repurpose the rice for a new meal. That basically makes the pot tomorrow’s dinner’s problem. So my claim still stands: one pot, delicious, possibly addicting, and should be on your plate asap. Heat a large pan over medium high. Add olive oil and sauté the chicken until mostly opaque. Season with black pepper and granulated garlic. Pour the soy sauce and honey and stir to coat. Bring mixture to a boil. Allow to cook until the moisture evaporates and the edges start to get dark brown, almost black, about 5 minutes. Stir often, it’s ok if the bottom of the pan starts browning. Transfer chicken to a serving plate. Carefully deglaze the pan with 1 tablespoon soy sauce, scrapping vigorously with a wooden spoon. Add the green beans and sauté until heated through. Season with 1/2 teaspoon granulated garlic and 1/4 teaspoon black pepper. Transfer to serving platter. Garnish with sesame seeds. For the rice, heat a saucepan over medium high. Add olive oil and sauté the rice until coated in oil. Add boiling water, bring to a rolling boil, cover and reduce to a simmer. Once cooked through, fluff with a fork and serve alongside chicken and green beans.